The “divorce” between PAS and the DAP which destroyed the cooperation in the Opposition Pact (PR) so far has not affected the position of Mohamed Azmin Ali as the Menteri Besar in Selangor, but the PKR-led state government will be facing major challenges. The Selangor government appears to be able to still function as usual but in a less effective manner. This was the view of several political analysts with regard to the current political situation in Selangor especially with PAS and the DAP controlling 15 seats each in the State Legislative Assembly while the PKR only has 13 seats. When PAS and the DAP can no longer sit down together, Mohamed Azmin who is also PKR deputy president, must now be extra cautious in his political game to manage the coalition government comprising the three political parties. The dean of the School of International Studies of the College of Law, Government and International Studies, Universiti Utara Malaysia (UUM) Prof Madya Dr Mohd Azizuddin Mohd Sani said PKR must be smart in playing the political game to ensure that it continued to receive the support to lead the Selangor administration. “Many perceive that Mohamed Azmin’s position as the Menteri Besar will probably not be affected with the non-existence of the PR. But, it is not impossible that a state election may be imminent in Selangor,” he told Bernama. 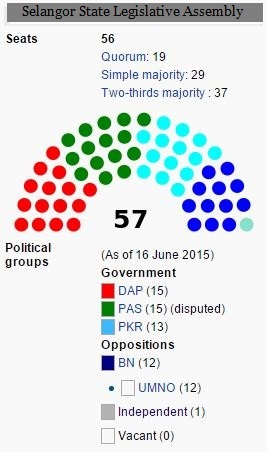 The Selangor State Legislative Assembly has 56 seats of which PAS holds 15, DAP (15), PKR (13), BN (12) and Independent (1). The PKR-led government currently is formed through the coalition between the DAP, PAS and PKR which hold 43 seats between them. Dr Mohd Azizuddin said if Azmin was forced to make a choice between the DAP and PAS, and if he chooses to work together with the DAP, and accepts splinter members from PAS who have defected, then he would strain relations between the PKR and PAS. If all the five PAS elected representatives do not support Azmin’s leadership as they could no longer face the DAP assemblymen, then the PKR-led state government would lose its majority, he said. This situation could arise because the DAP and PKR coalition would only hold 28 seats, thus equalling the seats held by the BN opposition, including the seat held by former menteri besar, Tan Sri Abdul Khalid Ibrahim who now functions as an Independent assemblyman supporting the opposition (BN). If this scenario arises, Mohamed Azmin must again seek the support to form the state government with at least a simple majority, that is to obtain the support of 29 assemblymen. “Azmin’s position will also be affected if there are assemblymen calling for a vote of no-confidence against his leadership and that the State Assembly accepts the motion. His position will be shakened because such a situation may lead to a state election,” he said. Meanwhile, a lecturer at the Social Science Study Centre, Universiti Sains Malaysia Prof Madya Dr Sivamurugan Pandian said the Selangor PKR government could still function if the assemblymen from the two disputing parties remained with the state government leadership. “However, without cooperation between the DAP and PAS, the elected representatives from both the political parties may no longer voice the views of their respective parties,” he said. He said if this happened, the state administration would become less effective because every decision was not made collectively like the case when the three political parties were in the opposition pact.